Who watches the hit television show, How I Met Your Mother? 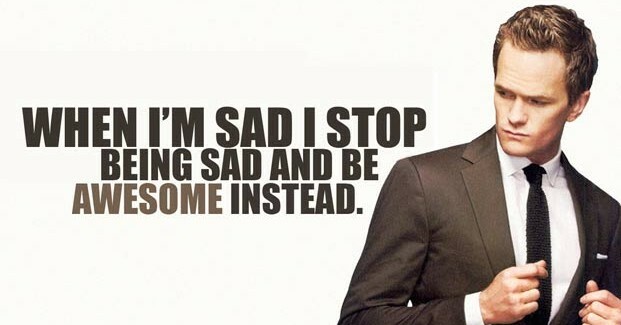 This week’s post is inspired by none other than HIMYM’s Barney Stinson. Do I have your attention now? Barney Stinson, played by actor Neil Patrick Harris, is a guy that could be characterized as many things…womanizer, man’s man…you get my drift. But I’ve noticed there’s a quality Barney possesses that makes him different than his fellow actors. Accept challenges. Barney is always up for a challenge. Tell him he can’t do something and he’ll prove you wrong! The word “can’t” doesn’t exist in his vocabulary. Always be up for a challenge. Like Barney, you may not really know if you’ll succeed or not, but that shouldn’t keep you from at least trying. In life and in your career, accept challenges that make you reach outside your comfort zone. It doesn’t hurt to see the silver lining in the outcome vs. what could go wrong. The glass is half full (of water, not scotch…)! Suit up! It’s one of his favorite phrases on the show and he has a fantastic point. Dress the part. If you want to be an executive, observe and dress appropriately. That means many things across various industries. Suiting up also does something for one’s self-esteem. That tie or blazer gives a confidence boost like no other and you’d be surprised at how people view you in a different light. Show them you’re serious about rising up through the leadership ranks and look the part. I’ve been known to rock a suit, wearing Superman socks. True story. Make it legenDARY! Wait for it… Stop wishing, start doing. Want this year to be awesome? Create a plan of action to make it happen. Ever notice how Barney always has a plan? It’s the key to his success! The plan may absolutely nuts, but at least he has a plan. My mom used to tell me, “fail to plan and you plan to fail.” I’ve said it many times before…smart lady. Does Barney have many other character flaws? You bet he does. He’s human. Just like you and me. We can learn from each other. Nobody said it had to be boring. Make this year awesome! Next Are Internships a Replacement for a College Education?